A Coach's Guide to Developing Exemplary Leaders presents leadership not as an inherent talent, but as a set of skills to be learned. Backed by over 30 years of original research and data from over four million individuals, this book offers a framework for leadership development in the modern business environment, and a set of best practices for training the leaders of tomorrow. The basic curriculum centers around The Five Practices of Exemplary Leadership®: Model the Way, Inspire a Shared Vision, Challenge the Process, Enable Others to Act, and Encourage the Heart. As fundamental elements of great leadership at any level, in any industry, these tenets establish a learnable, measureable, teachable set of behaviors that form the basis of evidence-based leadership development. This book shows you how to use the Five Practices and related tools to coach promising talent into leadership roles. Success stories show how these practices have been implemented in real-world situations, and worksheets and checklists help you easily integrate the Five Practices into your existing coaching regimen. As Baby Boomers retire in record numbers, the need for real, effective leadership is growing greater than ever; at the same time, there has never been a more disparate set of opinions about what "leadership" actually means. A Coach's Guide to Developing Exemplary Leaders provides an evidence-based model to help you develop leaders with real, quantifiable, tangible skills. 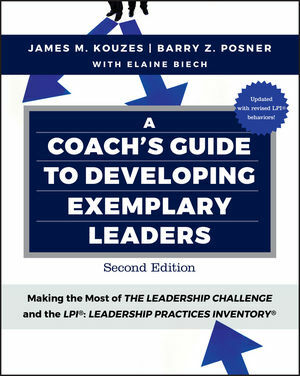 JAMES M. KOUZES and BARRY Z. POSNER are the bestselling coauthors of The Leadership Challenge, The Truth About Leadership, A Leader's Legacy, Credibility, Encouraging the Heart, and The Leadership Challenge Workbook, and over a dozen other books and workbooks on leadership. They also developed the highly-acclaimed LPI®: Leadership Practices Inventory®, a 360-degree assessment tool based on The Five Practices. They are among the most sought-after scholars and educators on the subjects of leadership and leadership development.